Remember the scene in “Willy Wonka and the Chocolate Factory” when the lucky children get their first glimpse of the candy factory – chocolate waterfalls, gum drop trees, marshmallow mushrooms… – and the look on Charlie’s face as he enters Wonka’s world of “Pure Imagination”? That scene was virtually duplicated at Boeing’s Puget Sound assembly factory when avid aviation enthusiast Jace Nylund first set eyes on his beloved Boeing 737 MAX on the production line. Jace, who is diagnosed with autism, is a senior at Colleyville Heritage High School in Colleyville, Texas, and a close friend of Envoy Captain Nick Kinner. Nick and Jace met through Nick’s wife’s former employer Best Buddies International, which is a non-profit that “creates opportunities for one-to-one friendships, integrated employment and leadership development for people with intellectual and developmental disabilities,” according to their website. 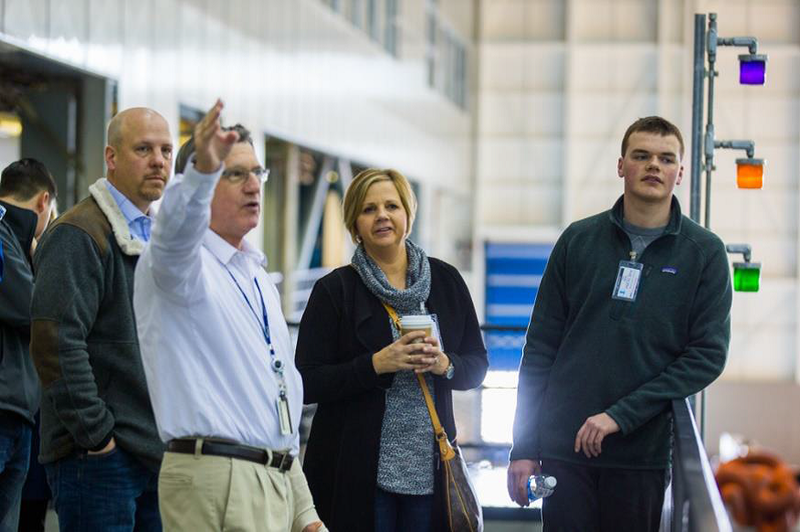 Familiar with Jace’s obsession with Boeing, Nick proposed the idea to offer Jace a tour of Boeing’s facilities to Jeppesen executive Mary Skelton who works with their parent company Boeing. She, in turn, proposed the idea to members of the Boeing team, and they were more than happy to offer a tour to one of their biggest fans. During their two days in Washington, Jace, Nick and their families toured the Boeing flight museum and the factories where they build the 737s and their heavy jets; the 777 and 787. Boeing also awarded Jace with a leather Boeing jacket with Test Pilot badges. “There was not a dry eye in the room as Jace donned the jacket and wore it proudly,” Mary wrote in an email. 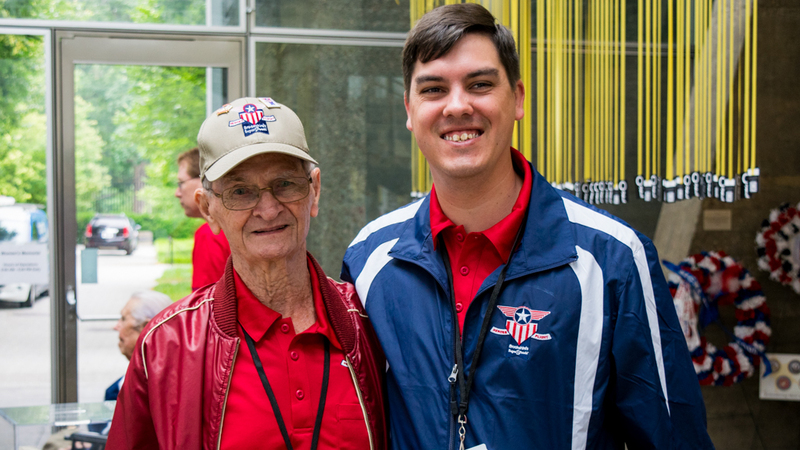 Captain Nick (right) with a WWII veteran during the Brookshire’s Honor Flight. For years, Nick and his wife Faye have worked or volunteered to help others, and continue to help out for Best Buddies events at least twice a month. At Envoy, Nick is frequently volunteering his time and flying for military charters, such as the Gary Sinise Foundation and Brookshire’s Honor Flight. Both of Nick’s grandfathers served in the military and his cousin has Down Syndrome, so naturally he wants to help those who are close to his heart. 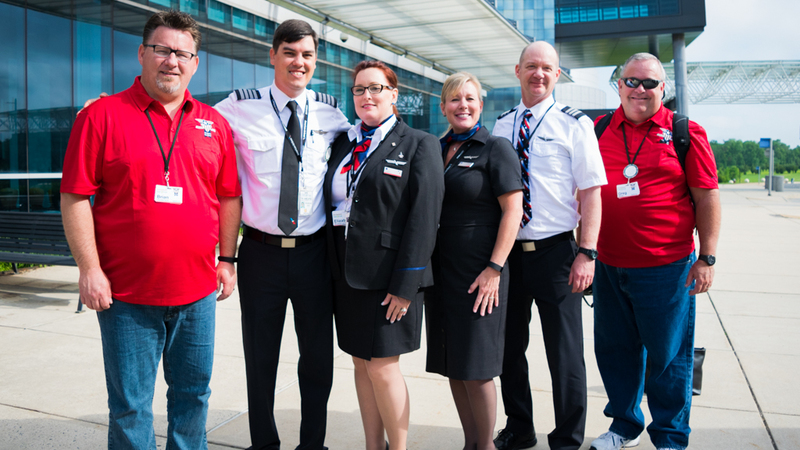 Captain Nick (second from left) with Envoy volunteers and flight crew in Washington D.C. Although Nick is about 11 months from flowing to American, he hopes to continue his passion for volunteerism once he joins the mainline. That shouldn’t be too difficult considering Envoy and American’s frequent collaboration on charity initiatives like Sky Ball, Maagic Flights and Snowball Express. And, even though Nick was the connection between Jace and Boeing, he’s just glad he could help.